"Thank you, Marietta McCarty, for showing us all the way home—the greatest gift an author could give a reader." After publishing a trio of acclaimed, accessible books rooted in philosophy, author and seasoned philosopher Marietta McCarty here applies her refined writing craft to a more personal subject, the emptying of her childhood home. 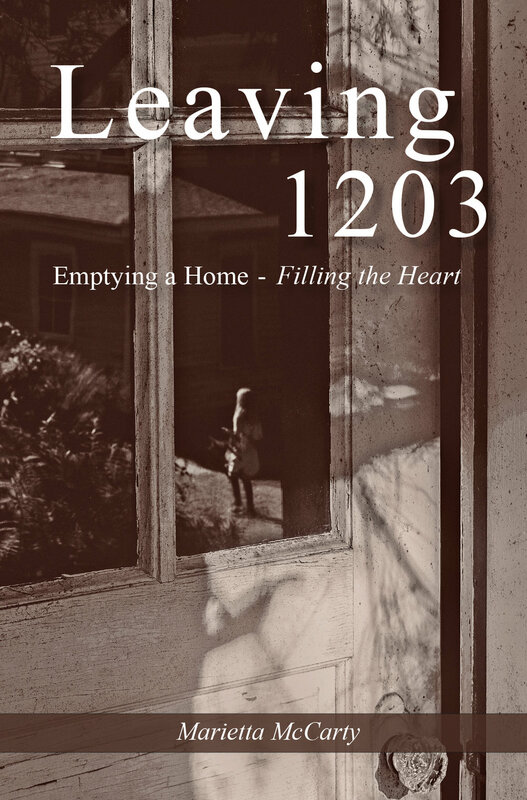 In LEAVING 1203: Emptying a Home, Filling the Heart, McCarty presents an intimate narrative of universal appeal. Bereaved following her mother’s death, McCarty faces the daunting task of emptying her beloved family home. How might she find a way through the inevitable emotional turmoil and the accumulation of more than five decades in the house at 1203? Told with McCarty’s characteristic wisdom, marvel, exuberance, and good will, LEAVING 1203 is about navigating that way through. The author draws on all available resources—friends and strangers, food and laughter, life lessons learned in the very house she now empties, and, not least, her newly-inherited West Highland terrier, Billy. McCarty simultaneously learns and deftly teaches the fine arts of remembering, letting go, and holding on to what matters most. She not only finds the way through, she shows the way. An engaging raconteur, McCarty invites you in and welcomes you home. She exposes her generous heart and pulls you close. This wondrous volume is a gift to its readers—a hug, long held. While home emptiers might find special comfort and resonance in LEAVING 1203, no home-emptying experience—actual or anticipated—is necessary for the reader’s enjoyment and appreciation of this book. “This is a work about a kind of rootedness and connectedness that no distance of time or place can erase. "LEAVING 1203 is a miraculous gift that keeps on giving long after you put it down. In poetic prose that hums with the simple grandeur of everyday life, this deeply intimate book will both enlighten and inspire you, making it impossible ever to look at a human being, or a house, or a starlit night, in the same way again. For me, reading it was like being wrapped in my favorite childhood blanket, frolicking through a world so right and true, so full of promise and rich in love, that I didn’t want to leave. But, like McCarty and her unforgettable canine companion, Billy, I had to, and when I did, a most exquisite thing happened: I found myself looking at my own life with a fresh set of eyes and a newly awakened consciousness. Suddenly, I discovered the lesson the book had been trying to teach me all along: 1203 is inside me, inside every one of us, right here, right now, no matter the circumstances of our lives or how far we may have strayed from our True North. Thank you, Marietta McCarty, for showing us all the way home—the greatest gift an author could give a reader." "Leaving 1203 details the writer's responsibility of emptying her childhood home. It truly evokes the beauty and spiritual importance of the memories of those we love and have loved us. The book has universal relevance as pretty much everyone will be presented with this task. McCarty's wisdom and sensitivity moves us past inherent sadness to a celebration of loved ones who have shaped our lives. Humorous and heartfelt, Leaving 1203 is a true tribute to family." Congrats! Question: What is better than publishing one book? Answer: Publishing 4 books and creating thousands of life rafts for others! You're doing it! Peace. Barbara McCreary’s review in The Shoreline in anticipation of Marietta’s March book events on the Crystal Coast. READ IT HERE.